Kevin Ryan in Tokyo – Page 15 – tokyokevin on Japan. Language. Learning. Tech. Culture. Women. By tokyokevin on September, 2014. Posted in Opinion, Technology, tools. Just finished one of the most important books of this year. 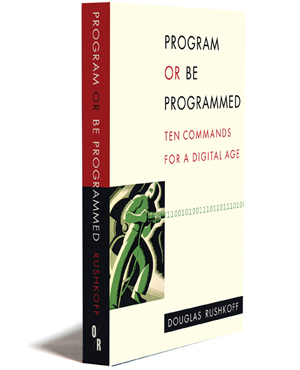 I had heard about Douglas Rushkoff”s book, and read some of his articles. I realized he was a real thinker, but not the extent until reading this book. I had heard that this book was about how coding is a necessary skill in this day and age, and the reasons behind it. I was completely unprepared for the content. There are ten chapters in this book, and not one single line of code. The tenth and least compelling of the chapters is the title of the book. The tenth argues that learning programming changes the way you view the world, and changes the way the world interacts with you. The other nine chapters are all examples of this concept. He looks at how digital technology have changed our perception and activities in the dimensions of time, place, choice, complexity, scale, identity, social, facts, and openness. I cannot recommend this more highly. It is a 152-page book that turns a programmer’s lens on the digital world itself, with surprising results and insights. I highlighted more of this book than the last 3 combined, and one of those was 700 pages. And yes, there are suggestions at the end for places to start learning to code. I plan to use excerpts of this in my IT Seminar class. I may even base a whole semester on the ideas included. I have also just downloaded his new book Present Shock. By tokyokevin on September, 2014. Posted in MOOC. This looks at first blush like a MOOC about how to make a MOOC, without ever mentioning MOOC. The line-up is stellar and the format looks very well thought out. Sign me up! As a member of CCK08, the first Connectivist MOOC in 2008, followed by many others, I am looking forward to this new course as a redefinition of shared courses online. Sign up now for Connected Courses. By tokyokevin on July, 2014. Posted in BreakTime, culture. The joy of books. What you don’t know can be very surprising. A little social commentary about using phones. The Sound of Taste is so visual, and again about food. I can’t resist. The Sound of Taste from Grey London on Vimeo.